At last, something new for ballooning enthusiasts to try, apart from just your traditional flight experience. We have launched a brand new voucher which gives people the chance to go ‘behind the scenes’ of the ballooning world and see what’s involved in typical hot air balloon flight in the South West. From the explanation of flight logistics & learning meteorological aspects to joining a flight as part of the crew and assisting in rigging, inflation and following the balloon whilst in flight (plenty of map reading and compass challenges!). 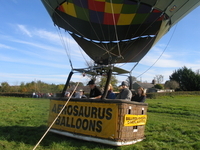 Currently, Aerosaurus is the only UK operator to provide this experience, but if you have done something similar in the past as either a ballooning operator or a participant please comment on this blog and let us know your thoughts. In the meantime, if you want to know more about the experience go to our behind the scenes voucher page. If you’d be interested in the Behind the Scenes Ballooning experience then please contact us.